On December 18th, after tests showed no contamination from an industial incident, the City of Corpus Christi was able to lift restrictions on drinking, cooking and bathing with city water put into effect on December 14th. The incident in no way impacted customers of the Water District. Water provided by the San Patricio Municipal Water District is safe to drink. There is no need for any customers of the water systems served by the Water District to discontinue any water use. Customers served by water providers that get their water from the District include residents served by the following local water providers: Odem, Taft, Portland, Gregory, Aransas Pass, Rockport, Fulton, Ingleside, Ingleside-on-the-Bay, Rincon Water Supply Corp., Seaboard Water Supply Corp. and, partially, Nueces County WCID #4 in Port Aransas. Each of these systems provides drinking water treated at the District's filtration plants located between Gregory and Ingleside. No District customers receive water originating from the City of Corpus Christi's O.N. Stevens Treatment Plant. Late on December 14th, the City of Corpus Christi issued a "do not use" order until further notice for customers of the city's system due to an unknown chemical substance contaminating water in the city's treated water delivery system. In an abundance of caution and until further investigation and testing the City is urging customers to avoid all contact with city tap water. The warning applies to residents inside Corpus Christi. The warning does NOT apply to customers of the South Texas Water Authority including Agua Dulce, Banquete, Bishop, Driscoll and Kingsville. 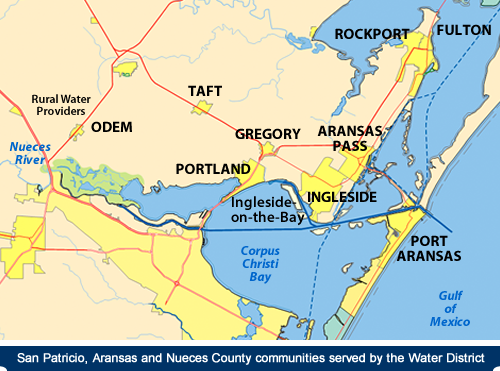 Nueces County Water Control and Improvement District No. 4, which has dual water sources, reports that state officials have no reason to believe that Port Aransas' tap water is unsafe. However, as a precaution NCWCID#4 stopped pumping water from the Corpus Christi system and is taking all its water from the San Patricio Municipal Water District system. Corpus Christi city officials have indicated that the contamination was caused by the failure of a back-flow preventer at an industrial plant near Interstate 37. The city reported it is working with industry, state regulators and consultants to correct the situation as quickly as possible. Late today an unknown chemical substance may have contaminated the City of Corpus Christi drinking water due to a recent back-flow incident in the industrial district. In an abundance of caution and until results can confirm water safety, the City is issuing an avoid tap water usage until further notice. The City is working the incident with industry, state regulators and consultants to correct the situation as quickly as possible. During a recent back-flow incident, unknown chemical substances may have contaminated our drinking water. In an abundance of caution and until we can investigate further and have the water tested, avoid all contact with the tap water. Only bottled water should be used for all drinking, beverage and food preparation (including baby formula and juice), making ice, brushing teeth, washing dishes or clothes, washing hands, and bathing until further notice. Boiling, freezing, filtering, adding chlorine or other disinfectants, or letting the water stand will not make the water safe. Please share this information with all the other people who drink this water, especially those who may not have received this notice directly. If you have specific health concerns, consult your physician.